I have to say, Spring is my favorite season! However, when October rolls around, you might find me saying the same thing about fall. It’s a beautiful toss-up between the two. In the cold silence of the long winter, it seems as if nothing is happening underneath the ground, no life, no fruit; everything is bare and bleak. But now, as the days are getting longer, the sun is shining brighter, and faint shades of color are attempting to make their entrance from the bushes and the trees, a bud appears, and there’s hope! Something was happening underneath the grave silence after all! Once again, God uses His creation to speak words of truth to our hearts…let’s take hope in what God is doing in our lives “behind the scenes”. Are you in a place of waiting right now? Do you feel like there is no progress in your ongoing quiet struggle? I encourage you to look at the buds on a tree limb or flower. Learn from their beauty. Study how intriguing this stage is: a vessel of expectancy, a compression of hope, a bowl of pending brilliance. 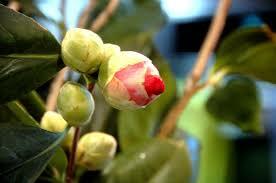 The bud is not quite developed enough to make its grand entrance onto Spring’s stage. The finishing touches of growth need to take place in its protective capsule. 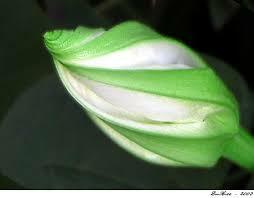 Underdeveloped, forced blossoming would only rob the flower of its deserved performance. Learn from the bud of a flower. Rest, mature, be patient; your time is coming. You are not alone in your maturing capsule, my friend. Your Creator is with you and knows exactly the right time for you to blossom. Trust Him in the waiting, and then flourish in His most glorious appointed time.